I was three years out of college, and nearly two years into my job as a Youth Director for a nonprofit organization. I had an office, business cards, long lunch breaks, and a retirement plan. My cat, Lilah, and I had our own apartment, and I was living in the town where I grew up – Sarasota, Florida – about 20 minutes away from the comfort of my parents. Most of my friends were settling down with a spouse and maybe some children, and I felt a certain pressure to do the same. I was living a life that I thought mid-twenty-somethings were supposed to live. I wanted adventure, travel, nature, mountains, and the West. I had never been west of Missouri, but Wyoming was calling to me. People would ask, “Why do you want to go to Wyoming? There’s nothing out there.” I would say, “Exactly.” I longed to drive on an open road surrounded by mountains and sky. It was partly the nothingness – the stillness and serenity – I wanted, but also the fullness, the vastness, the majesty of the natural world, the knowing that there is so much greater. I wanted to feel free. I also realized that I had been putting all of my effort into my “plan B” – a secure job – and not much into what I really wanted to do – music. I have a music degree and was playing some gigs, but I was too afraid to really pursue it. Everyone said it would be too hard and I would struggle. But I came to a point where I decided I’d rather struggle for what I really want than settle for safety. I wanted to go on a soul-searching journey that would take my song writing to the next level. So I started searching for my next step and applying for jobs in and around national parks, but I never expected anything to come of it. Even if an opportunity did come up, I didn’t think I would have the guts to go through with it. She told me it would either be in the kitchen or in housekeeping. I had never done hard labor. I thought of my office, my recent promotion and raise…and I accepted the job. I was terrified, but I knew I had to do it. I started to unravel my cushy, comfortable life. It wasn’t easy, but I’ve never once looked back. I quit my nine-to-five job, got rid of most of my stuff, and drove across the country by myself. I had never driven outside of the state of Florida. I moved into my dorm with a roommate, found the employee dining room after getting slightly lost in the woods, and reported for dishwashing duty the next day. I was promoted a few weeks later to a bussing position. Even though the transition was rough at times, and on my third day I ran through the kitchen’s back door crying, taking that dishwashing job was one of the best decisions I ever made. It was worth the challenge to explore a place I had dreamed about for so many years. 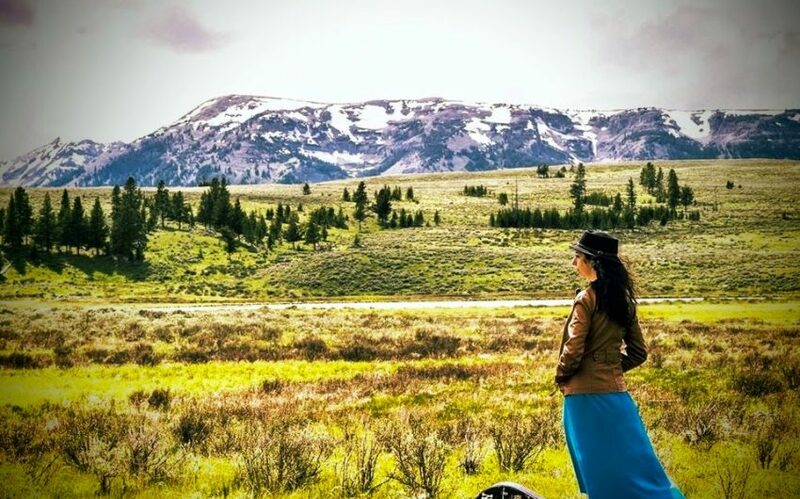 It propelled the beginning of my 20,000+ mile, solo journey all over the country, and inspired several of the songs on my newly released album, recorded in Bozeman, Montana, about 2 hours north of the park. This summer, I’m back at Yellowstone working as a tour guide, because there’s nowhere else I’d rather be. This place speaks to my soul. Sometimes you have to take risks and make sacrifices for what you really want. It isn’t always easy or pretty, but the challenges and transitions are all part of the journey. Fear is our greatest obstacle, yet sometimes it’s the very things we’re most afraid of that we absolutely need to do. Those are the things that push us out of our comfort zones to grow more than we ever thought possible. To hear Amber’s debut album, inspired by her journey across the country, visit www.amberikeman.com.